Bestseller. Ordered for birthdays, get well, thank you, congratulations, a new baby girl. 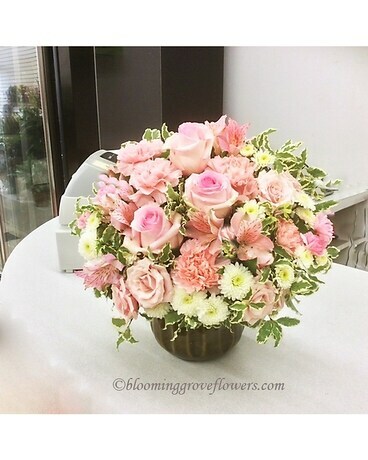 Flowers: roses, spray roses, button poms, carnations, peruvian lilies, accent greenery and fillers in matching ceramic container. Some flowers will be replaced to better reflect the occasion. All around. Flowers and Containers subject to change based on season and availability. However we will create something similar using products with an equivalent value: we will find substitution to assure the best quality and presentation for your special gift.